this past thursday was my 21st birthday! to celebrate i went to l.a. with my mom, and met kelly and shannon at the ivy for lunch. after lunch my mom and i went around shopping a bit, and finished the night off by seeing a movie. friday night i had a bday bash with all of my friends. 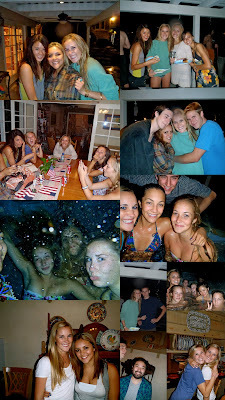 there was swimming, food, music and good people. i got three cakes made for me by my lovely friends, and cupcakes to top it off. i've got one of the best group of friends, and they're all different which makes them so great. i love when we all get together with eachother and they get to know who i always mention. it was a good way to bring in my new year. thankyou to my mama for such a great birthday day, and for putting up with all the nonsense my friends bring to the house! happy birthday Kerry! i don't care what they say- you're the greatest!